BEAT butter, sugar, dry pudding mix and egg in large bowl with electric mixer until well blended. Mix remaining ingredients. Gradually add to pudding mixture, beating well after each addition; cover. Refrigerate 1 hour or until firm. PREHEAT oven to 350 degrees F. Roll out dough on lightly floured surface to 1/4-inch thickness. 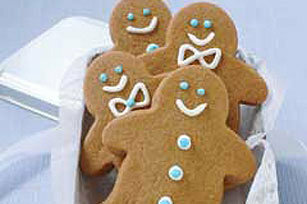 Cut into gingerbread shapes with 4-inch cookie cutter. Place, 2 inches apart, on greased baking sheets. Use straw to make hole near top of each cookie to use for hanging. BAKE 10 to 12 minutes or until edges are lightly browned. Remove from baking sheets to wire racks; cool completely. Decorate as desired. Insert colorful ribbon through holes to hang cookies on tree..
To easily decorate these cookies, fill resealable plastic bag with prepared frosting. Seal bag and cut small corner off one of the bottom corners of bag. Roll down top of bag to squeeze frosting over cookies to decorate as desired. I have a son and a daughter who are 4 and 7, and they love decorating cookies. They always end up making a mess though. I will have to try the plastic bag idea. That should help them a lot!